Difficult, but on the balance of probabilities it is likely VT.
LV Hypertrophy [Sokolow; SV1 + (RV5 or RV6) > 35mm) or RI + SIII > 25mm]? RV Hypertrophy [R/S ratio V5 or V6 < 1 or R/S ratio V1 > 1 or S1S2S3 pattern]? This is very tricky! 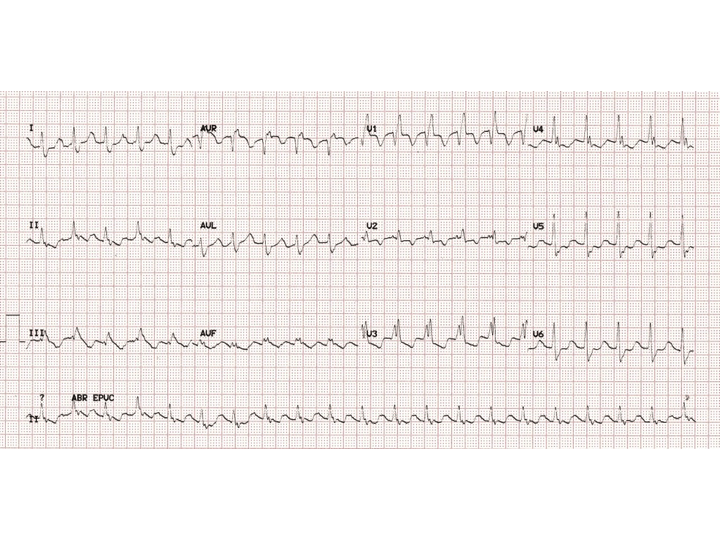 The QRS shows a RBBB pattern and is longer than 140ms: this favours VT. There is positive concordance: this also favours VT. However, VT should have a rate of > 130 min-1. A rate of < 110 min-1 is referred to as an accelerated idioventricular rhythm. Causes for a slower rate might include AV nodal blocking drugs, which may also prolong the QRS complex. Further evidence against the diagnosis of VT is the lack of extreme axis, the absence of AV dissociation, fusion, or capture beats, and the absence of Brugada’s sign (RS nadir > 100 ms). No history was provided, so interpretation must proceed with caution.